Penny Houze has worked as a letter carrier for 26 years and she will proudly tell you so. “I love the people that I come into contact with on the routes. I’ve even delivered mail in a blizzard!” But Penny did not always have a good, steady job to pay for basic necessities such as food and a comfortable home. Hunger and homelessness consumed Penny’s life for many years until she left her husband and secured a job. But with just a minimum wage, she could only afford a one bedroom apartment for her and her two children. Penny remembers those years, sleeping on the floor while her children slept on the bed, struggling to afford childcare and enough food for them to eat. Penny still remembers the meager, bland meals of chicken and rice and the absence of fresher, healthier, more varied meals. “I never knew about food banks and food pantries until my babysitter told me that I should go down to the local church pantry to get food for my family.” Penny visited that local food pantry twice to receive some extra groceries. For the first time in a long time, Penny went to sleep with a full stomach. She continued to work hard every day to provide for her family, but she was still unable to make ends meet, even with help from the Supplemental Nutrition Assistance Program. She decided to move back home to Connecticut so she could be close to her family. She and her children moved in with her mother, and as she worked two jobs, she searched for a higher paying one so that she might be able to work fewer hours and spend more time with her kids. 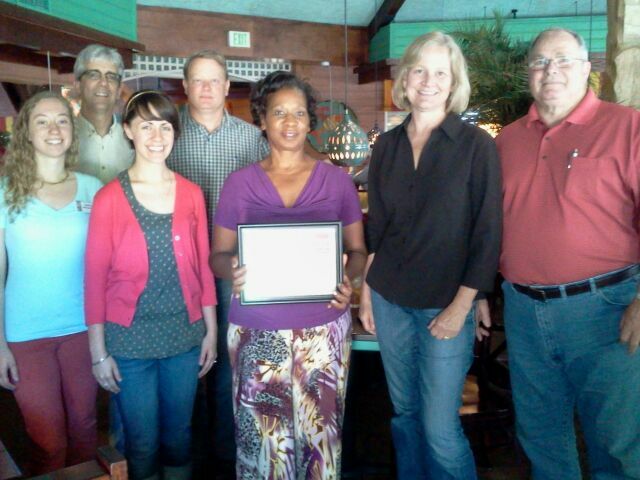 Penny (center) stands among Food Bank staff members holding a certificate of appreciation. And then it happened. In 1989, Penny finally landed a job with the local post office and began her career as a letter carrier. “Being a letter carrier paid for my children’s education, my home. It even paid for their braces!” reflected Penny. She worked for the West Hartford post office for 16 years. Penny continued to give back through the Stamp Out Hunger food drive even after she moved to Raleigh in 2006. After almost 10 years, she has continued her involvement in her local community by serving on the Raleigh Letter Carriers Stamp Out Hunger Committee. Penny’s passion for the letter carriers’ food drive radiates from her big smile. She remembers her experience trying to work, raise kids, and gain financial independence while struggling with food insecurity. She knows the devastating effects of hunger, and she knows exactly how we can all pitch in and make a difference for a neighbor in need. Help Penny pay it forward by participating in the annual Stamp Out Hunger food drive. This Saturday, May 9, fill a bag with your food donations and leave it by your mailbox. Your letter carrier will do the rest! For a list if most needed items and to donate online, please visit www.foodbankcenc.org/LetterCarriers.